What do I see there? What are these numbers? This is a sentence I often heard when I met people watching the dashboard. "oh..look, hopefully the # of cakes are not overtaking the # of gin tonics" ;-) - those who frequently had a look at it made kind a game out of it! 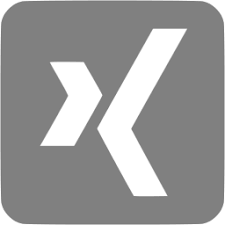 Last weekend we tried a new approach to talk about DATA Crunching! We did not just participate on an exhibition as an exhibitor! We wanted to do something different! So we came up with the idea to adapt and reuse our party dashboard of our office inauguration (link) last year. The event "sportz und beatz" in Thusis seemed to be a perfect event for this. 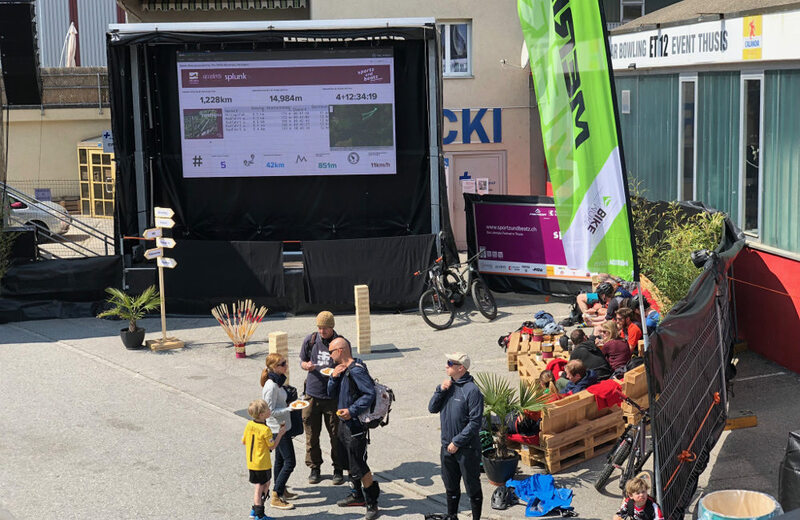 As a partner of the lifestyle festival "sportz und beatz" from the 12th to the 14th of April 2019 (link) in Thusis GR, we developed an event dashboard to engage with visitors and at the same time provide value for the event! The event is focusing on mountain bike experiences, but also provides great music on stage with bands of different kinds and a specific DJ Line Up (see the program). 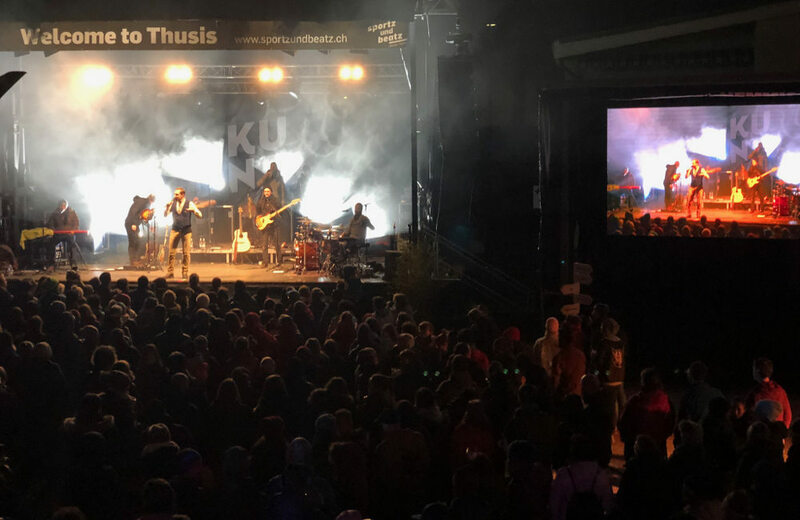 During these 3 days, people from all over Switzerland, but also Germany and Austria, were visiting the event in Thusis, in the Mountains of Grison. Beside the concerts and sports activities, guests also get delicious food and have choices of several drinks at one of the bars. So there is a lot of data around waiting to be tracked and visualised on a dashboard. With the event dashboard we visualised event data from different sources. On one screen we visualised the drinks and food consumption combined with a mood survey. For the mood survey we used wifi tokens, each related to an emoji icon and attached on a poster asking for peoples' moods. 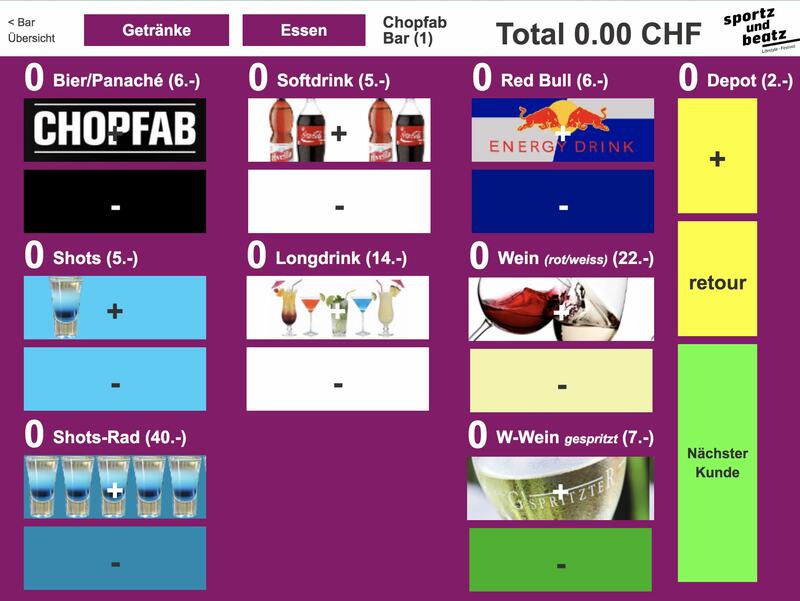 To track the drinks and food consumption, we developed a point of sale page, optimized for iPads. Every bar had 2 to 3 iPads. By pressing the respective button when selling something, the bar team was permanently sending events and tracking what they have sold. This also had the advantage that the iPad point of sale, provided them with the calculations of every single ordering. So win:win for the bar team, but also for the event team. Every time a product button was pressed on the iPad, an event was generated, which was sent to our splunk> server. 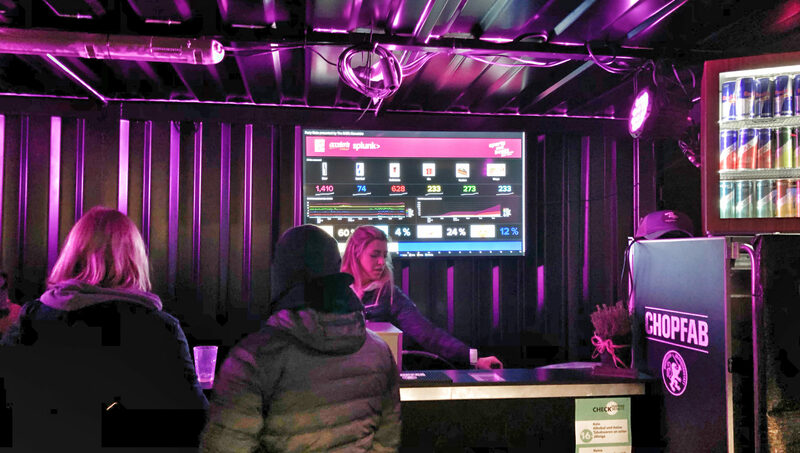 The numbers on the event dashboard were increasing nearly in realtime and the event visitors were engaged and tried to influence them accordingly. 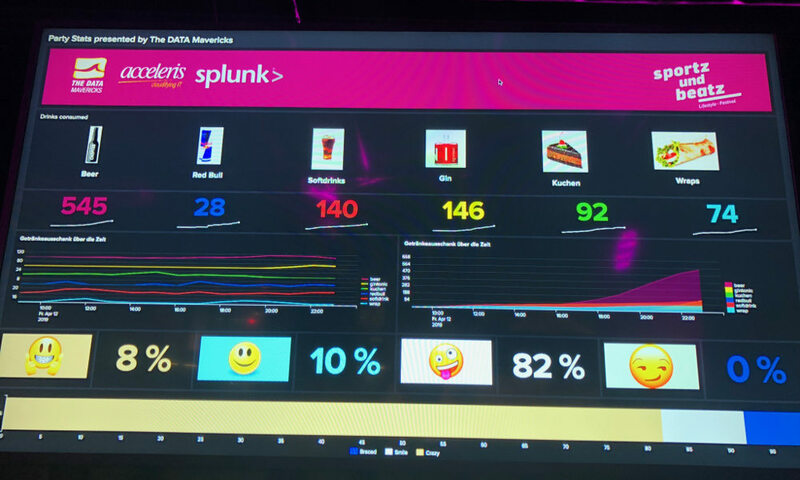 During the evening we switched the dashboards to the newly implemented splunk> darkmode, which created even more attention and was perfect for a staged atmosphere. And the great thing is that also the event organiser gets a huge benefit out of it! In the background we collected all the data, not only those presented on the consumption stats dashboard. 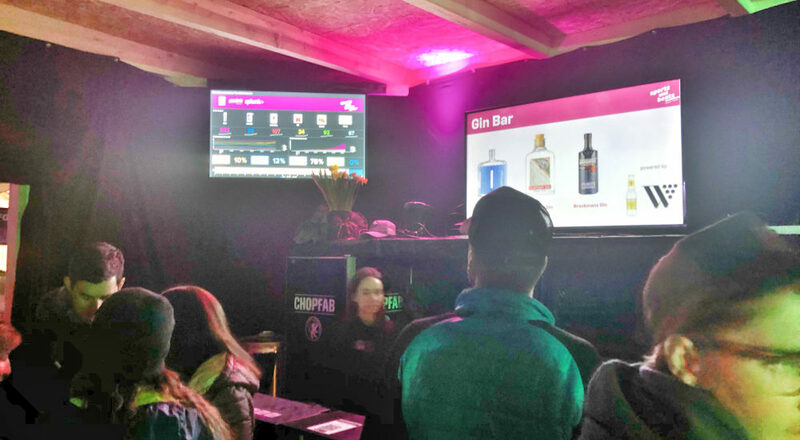 These data provide real time insights on revenue per product and bar over time and can be used to analyse based on specific needs during the event, but also for the future! On a second screen we were providing visualisations of the mountain bike activities. While every group was led by a certified mountain bike guide, the guide was also tracking their ride with the "strava" App. It was the API of strava we used to request data to these rides and summarized it on our sportz dashboard. From time to time, these dashboards were presented on a big screen on the festival venue and commented and explained by the speaker. In fact, the event dashboard does not only provide a huge differentiation for our marketing activities, which was the main purpose initially. But using event data does also position your event, summit or exhibition as digitised and a future oriented event and engages your customers directly. And it is fun to see the dashbaord on a big screen and hundreds of people were suddenly excited about analytics;-)! With splunk> we have the opportunity to correlate whatever data source is expected and visualise it accordingly to build transparency! The event dashboard is a great way to experience that in a funny way!